I spent a day last week stumbling around in a sleep-deprived stupor because I had been up late the night before, and it was all this book’s fault since I’d refused to put it down until I was finished. Totally worth it, though. Talk about a page-turner! 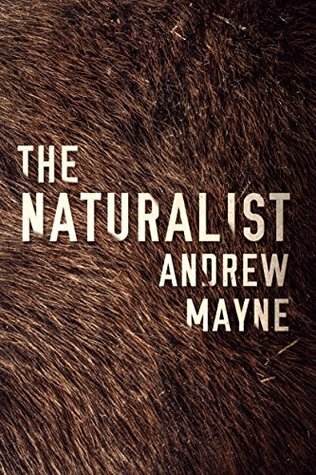 The Naturalist was exactly what I wanted out of a mystery-thriller—fascinating, addictive, and dramatic in all the best ways. It also captivated the science geek in me by featuring a protagonist who uses the study of plant and animal behavior and physiology to solve crimes, his specialized knowledge allowing him to spot patterns where others cannot. Think The Da Vinci Code, but with biology. Our story begins as computational biologist Theo Cray gets a call from the police while on a field research trip in Montana. The body of Juniper Parsons, one of his ex-students, has been found in the woods near a small town, and the cause of death appears to have been a rogue grizzly attack. However, Theo is not convinced, recognizing unnatural signs in the evidence. Despite the terrible claw marks and the traces of fur on the victim, he’s not sure that whatever killed her was even an animal. More likely it was a man, he insists. Killing like an animal. Unfortunately, the police are no help, especially once Fish and Wildlife Service puts down the bear believed to be responsible for the savage attack. Knowing that his former student’s true killer is still out there though, Theo is unwilling to give up and decides to conduct his own investigation, uncovering a disturbing pattern of missing persons reports and mysterious deaths that go back for more than thirty years. All the incidents happened in or around the state of Montana, many of them involving young women. In the cases where remains were recovered, the mutilated bodies all displayed the same kind of claw marks found on Juniper Parsons. Following a trail of clues, Theo begins finding more victims and knows he’s getting closer to the truth, though inevitably his efforts draw unwanted attention as the police start suspecting Theo himself. The Naturalist is the perfect thriller novel for the science lover. Yes, it can get a little farfetched at times, requiring the reader to simply roll with it, but with a story this enthralling and irresistible, you’d be surprised at how much I’m willing to let slide. A couple of minor plot holes and a few dubious moments were not enough to detract from the enjoyment. Another amazing thing about this book is its protagonist. Theo is a professor in an extremely esoteric field, so he’s always having a hard time getting others to understand his evidence or how he’s getting his data. It also doesn’t help that he’s a bit socially awkward, and his brain is wired to think in a very different way than most people. In spite of this though, I found him remarkably easy to relate to—and not just because of the shared interest in biological sciences. Above all, Theo is driven by a sense of duty towards his murdered student, and while his guilt and emotional self-punishment may have been a tad unfounded, it’s hard not to feel sympathetic towards someone whose heart is so genuine and in the right place. He attacks his mission with indefatigable zeal that almost borders on obsession, but you’ve also got to admire his persistence, especially when he finds ways to get creative. While Theo is highly intelligent, his doggedness and complete lack of street smarts often leads to solutions with successful results but appalling side effects. Then there’s the plot, which sank its hooks into me and dug in deep. The story’s tone and style are arguably similar to that of most thrillers, but like I said, this novel had a scientific angle to it that made it special. A good balance of action and suspense kept the pace swift and strong, and some of the more mysterious and atmospheric scenes were even touched with a hint of horror. The final chapters of the book, AKA the section that had me devouring the pages at the expense of a good night’s sleep, were so intense and insane that I doubt I could have stopped reading even if the house was burning down around me. Man, I really hope I won’t have long to wait for the sequel, because it does appear The Naturalist is the first book of a new series. Cleverly addictive and hugely entertaining, this book had me hanging on every word from start to finish. If I’m reading a lot more mystery-thriller these days, well, it’s because of books like this, and I can’t wait to read more from Andrew Mayne. it looks quite well done there! I didn’t know about this one and the cover is also really intriguing! Oh my goooosh!!! This sounds perfect! Yeah, I had a feeling it was going to be a good one, and I was glad my instincts were right! And a book that keeps you up burning the proverbial midnight oil is one to keep under one’s radar, indeed! Great review, thanks for sharing! I have a copy of this and your review makes me so excited. Can’t wait to pick this up now. Ooh, I look forward to your thoughts! This is new to me and it sounds amazing. I need more science thrillers in my life.